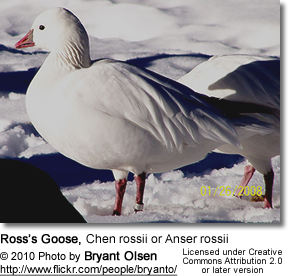 The Ross's Goose (Chen rossii or Anser rossii) is a North American goose. In 1861, Mr. Bernard Ross sent a specimen of this small goose taken at the Great Slave Lake, Canada, to Mr. Cassin for identification. Mr. John Cassin -- at that time the Curator of Birds at the Academy of Natural Sciences - honored Mr. Ross by naming this goose after him. This species breeds in northern Canada and winters in the southern United States (primarily central California). Smaller numbers can also be found from Colorado to central Mexico and on the Texas coast. Scattered populations exist along the East Coast. 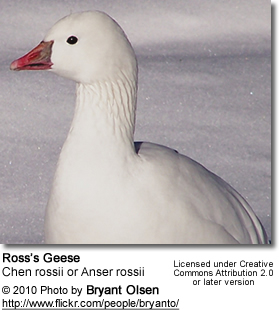 The Ross's Goose is a rare vagrant to Western Europe, but it is commonly kept in wildfowl collections and so the true frequency of wild birds is hard to ascertain. Individuals or small groups have turned up in Holland and Britain, however, which seemed to be of natural origin. This small white goose averages 22 to 25 inches in length and weighs between 30 to 73 ounces. The plumage is white except for black wing tips. It has dark eyes and a short, triangular pink-colored bill. It has a round head, dark-pink legs, and a greenish warty patch at base of bill. 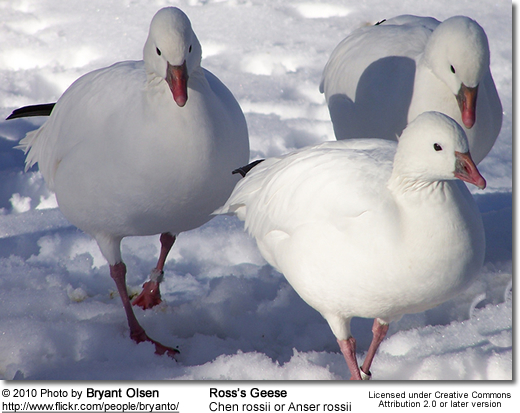 It looks like a miniature version of the more common white-phase Snow Goose, except it is approximately 40% smaller. Also its bill is smaller in proportion to its body and this species lacks the "black lips". The dark phase is extremely rare. Both genders look alike, but the male is slightly larger. The plumage of immature birds is pale gray above and white below. There is a grey line through the eyes. Their legs, feet and bill are grey, turning pink as they mature. The hen incubates the eggs while the male stays nearby and guards the nest. The female covers the eggs with down when she leaves the nest, to keeps the eggs warm while she is away and also to hide them from predators.